It’s that time of the year again! The 2nd Annual Town & Country Jewelry Award results are in! I analyzed some pieces of the awards last year and you can read it by clicking the link. I’m not going to go through all those points from last year. I want to only look at one main issue I had with the awards and focus on how the awards have moved forward. If you are a subscriber to Town & Country magazine you probably got a cover like this with your magazine last week. Anne Hathaway in a multi-colored dress with a long rose gold earring. The rose gold earrings are by Vhernier, named innovator of the year in the Town & Country Jewelry Awards. A great designer but this earring choice was not a great statement of things to come. The other cover on newsstands was no different in the jewelry department. This time rose gold and jet earring by the same designer, Vhernier. There was something missing from the cover that I noticed immediately, compared to last year. Here is the last year cover if you don’t remember or if you haven’t read the post from last year. See in the right-hand corner in red? It is the call out of the Town & Country Jewelry Awards! When I first saw this magazine, I was concerned that the awards were a one-time thing. For me that would be upsetting since I just renewed so I could receive this issue! I think for the Jewelry Awards Issue the accessories should be a bit bolder. I was pleased to see a change in the voting. Instead of a small panel like last time (where 2 of the judges also won in the Media Category) this time more than 200 ballots were cast among Jewelry designers, collectors, T&C editors, industry experts and influencers. I was not on that list but the editor’s letter by Stellene Volandes mentioned the voting logistics in the first line. I really think this is better than leaving it to a select few that may have other interests involved. For me this issue got off to a better start. I like that there are 12 categories, not too many but not too few. I do subscribe for the jewelry so I want to see plenty of it. A nice addition to the magazine was some of the categories also have finalists. For colored stones Chopard won, below is a stunning and colorful pair of earrings. The runners up were Irene Neuwirth and Martin Katz. Bulgari’s Wild Pop Collection: Bulgari is using more color in their creations and channeling the 1980’s. I was fortunate enough to walk by the New York store on 5th Avenue and catch some of their masterpieces. Tiffany’s Save the Wild Collection: I have been watching this collection since it launched in 2017. Tiffany has animal themed jewelry like the elephant brooch below from their website, in which Tiffany is donating 100% of the profits to the Wildlife Conservation Network, which includes the Elephant Crisis Fund. You can learn more on their website. What I love about this collection is the price range $250-$35,000, so you do not need a lot of money to own a piece of jewelry that gives back to nature. One category not listed is for social media influencers. Again, I was glad to see the social media panelists no longer choosing the winners. I think that category was unnecessary given how little is proven on how much influence social media has on branding and shopping. Let me know your thoughts on the magazine. Is there a category you would like to see? I would like a few emerging designers, Town and Country does a lot with main stream, well known jewelry houses, that I think introducing some new faces would help make the magazine feel like a better source of what is happening in the world of jewelry. If you would like to see how to measure social media and its influence in your business send me an email and we can talk about your strategy and business goals. Return later as I get back into a more regular schedule of blogging on Data in the Rough! Thank you for visiting! I learned a lot over the long weekend viewing the auctions for April. If you follow my Instagram account, you will see posts of jewelry that has been auctioned as well as pieces coming up that I got to see and try on! Although I learned a lot about the jewelry one piece of information left the biggest impression on me and that was the auction of Fred Leighton’s personal collection. This man was a jeweler to the stars. I never got the chance to enter his shop while he owned it but I got to see some of his celebrity pieces up close when Fred Leighton came to Dorfman’s in Boston. Looking at the auction book for a little more about his life I came across an interesting insight into his life that resonated with me. On page 8 of the auction catalogue the first line of the second paragraph reads, “After opening a florist shop in Los Angeles, Mr. Leighton returned to New York in the early 1960s and purchased a shop specializing in Mexican crafts, silver and folk pieces on MacDougal Street in the West Village.” This stood out to me because I don’t come from having a background in the jewelry industry. I have no relatives that I was aware of that did anything with the jewelry business. I have a background in business but a love for jewelry. It was refreshing to see someone start out on one path and transition to another like Mr. Leighton. Breaking into an industry can be difficult. For those that follow my blog I have been sporadic with my postings over the year. For 8 months I was unemployed and recently started a new job. It has nothing to do with jewelry which can have its good and bad points. Trying to find a job that blends your passion with your skills (math in my case) can be a challenge. Those that do not have those skills can look down on those with ‘less creative’ talents. For the next few weeks I plan to highlight designers and businesses that have done better at mixing art and science. I will focus on those with a less traditional background or those that have both a head for numbers and artistic flair. This post is focusing on Leighton and his auction. As I went through the preview at Sotheby’s in New York City, I was struck by how many were coming to find one last hidden treasure that Leighton was holding back. I watched a few dealers going over necklaces and rings with loupes taking notes of the lots they liked. The impression I got was that many of these pieces meant something more than money to Mr. Leighton. I came across a set of Van Cleef & Arpels cat brooches with coral stones. These were so small and not at all like the animals you see now. One of the associates told me nobody that day had even looked at them. I obviously took them out to see. I love cats and couldn’t bare the thought of these cute gems going unwanted. They did sell so some one was paying attention. But not all of Leightons jewelry sold. I looked at the total auction and divided the lots by jewelry and other (furniture, paintings, etc). The top table is by the number of lots and the second table is in percentages. 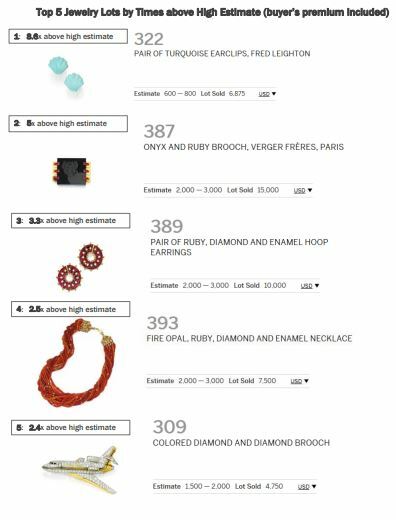 There were 229 lots offered 95 (41%) of the lots were jewelry; 134 (59%) were other items. Overall 84% of the items sold. By category jewelry did not do as well in % sold as the other items. But what about items that sold far above the estimate? Well I looked at that too! Of the lots sold on average the non-jewelry category did better. Leighton not only had an eye for jewelry but also furniture, paintings and other beautiful, unique objects. The top 5 jewelry items that performed the most above their high estimate (buyer’s premium included are below). I was surprised at what did so well and what did not sell. This snake bracelet of gold and rubies did not sell, but a pair of turquoise shell earrings by Leighton estimated to go between $600-800 sold for $6,875. These pieces were pretty but also quirky and many of them fun. I remember seeing the documentary the September Issue, about getting the fall publication by Vogue put out, and watching some of the deleted scenes. My favorite part of the documentary was the deleted scene with Andre going to Fred Leighton’s shop to see some of his jewelry highlights. It starts with Fred Leighton himself waving some beautiful vintage fans in front of the camera and heading over to talk to Andre in more detail about the fans he is looking at. Leighton in smiling and singing as he makes his way to the editor. Enjoying himself through out the short scene. Fred Leighton did not come from a background in jewelry and in some ways, I think that was a strength. He had an eye for jewelry but was a business man by trade. Above was how his jewelry was laid out in the cases. Leighton had miniature replicas of Asian inspired furniture that he had made. His family lent it to Sotheby’s because they did not know what to do with it or even if they wanted to keep it. Mr. Leighton, I have a feeling would have been pleased to know that his miniature furniture was a hit! I asked an associate about what would happen to these props, after the sale and with the interest that the public was showing they too may soon be on the auction block at Sotheby’s. Be on the lookout! Before I conclude I will let you see what the top 3 other items that performed above expectations. Yes, that looks like a gold foot. Not sure if the auction house was off on the estimate or they had misprints, but Leighton did have some unique tastes and others liked it. He did not follow trends but created them and found items that match the style and quality that he wanted to be known for. I hope you will return soon as I get back into posting more on my own personal journey to try and blend my love of jewelry with my analysis skills. Please comment below or send an email if you would like to share parts of your own career journey. As the saying goes, it’s not where you came from but where you are going that counts. Data in the Rough is back!